Stars: Osamah Sami, Helana Sawires, Don Hany, Majid Shokor, Ryan Corr, Robert Rabiah, Maha Wilson, Genevieve Picot, Spencer McLaren. 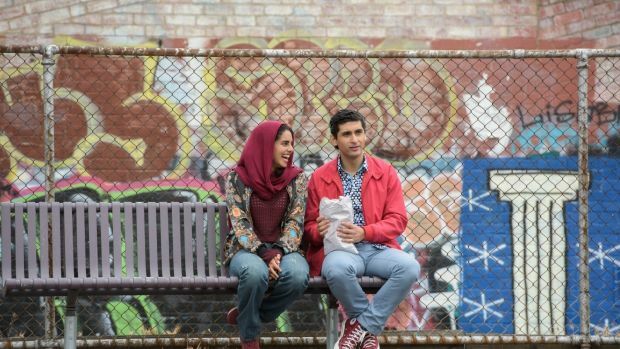 Australian filmmakers often struggle to make genuinely amusing big screen comedies, so it’s pleasing to report that Ali’s Wedding is a nice feel good romantic comedy that celebrates our multicultural identity. It follows other recent local films, like the superior Alex And Eve and the fairly routine Unindian, that have explored cross cultural romances with a unique and quirky Aussie sense of humour. 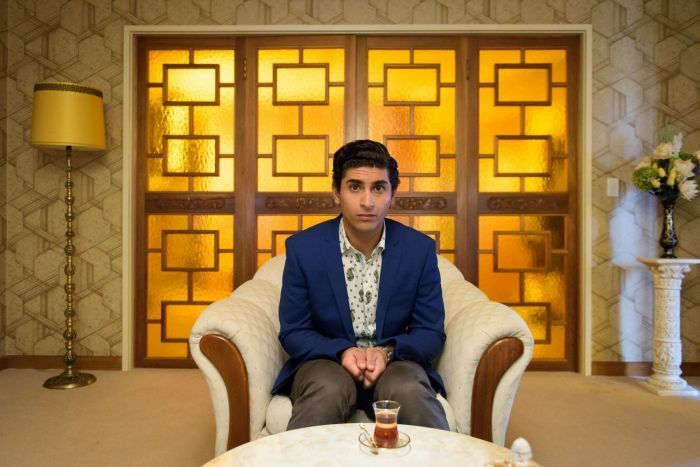 Ali’s Wedding is based on the semi-autobiographical novel Good Muslim Boy which was written by Iranian born comic and actor Osamah Sami. He has adapted the book to the screen in collaboration with screenwriter Andrew Knight (Hacksaw Ridge, etc), and the pair have obviously taken some liberties with the material for dramatic purposes. The film explores the immigrant experience of that generation who are caught between two traditions – the old ways of their parents and the culture of their adopted homeland – which brings a spark of tension to proceedings and lends a contemporary touch to the material. Knight and Sami gently mock some aspects of traditional Muslim culture and their treatment and subjugation of women, but there is no hint of malice in the writing. Sami plays Ali, a thinly fictionalised version of himself. He is part of a traditional Muslim family who live in Coburg, an inner suburb of northern Melbourne. Ali’s father Mahdi (played by Don Hany, from Healing, etc) is the respected local Imam who is a pillar of the community and who stages sometimes radical plays in the mosque. There is a rivalry between Mahdi and the more doctrinaire and traditional Sayyed (Majid Shokor). Mahdi only wants Ali to do well at university and become a doctor who will be respected in the community. But when Ali fails to get the marks to study medicine at Melbourne University he does the only thing he can think of – he lies about his grades – and this decision leads to further complications and soon his life spirals out of control. Ali’s family are eager for him to marry a good Muslim girl and are trying to arrange a marriage between him and Yomma (Maha Wilson), the daughter of one of Mahdi’s wealthy parishioners. But Ali is besotted with fellow medical student Dianne (Helana Sawires, in her feature film debut), the daughter of a Lebanese born owner of the local fish and chip shop. Dianne actually scored the highest entry marks for medicine, a fact conveniently ignored by the more patriarchal members of the mosque. But she helps Ali with his studies, and the pair grow closer. Romance blossoms, although Ali finds it hard to tell his family the truth. Ali’s Wedding deals with themes of family, duty, tradition, love, culture set against the backdrop of multi-cultural society. In this it shares a few similarities also with the recent American romantic comedy The Big Sick, which was also autobiographical in nature. However, Ali’s Wedding delivers some broad comedy and some big laughs, and the main characters are quite recognisable. The characters are well drawn and there is a great affection for them in the writing. Some of the peripheral characters though are little more than stereotypes. The director is Jeffrey Walker (the recent Dance Academy: The Movie, etc) who hails from a background in television. He handles the material well, and this is a gently endearing comedy that has been handled with restraint. However, he cannot completely disguise the formulaic, somewhat predictable and cliched nature of some elements of the film. And there are a few missteps along the way – the scene in which Ali and his friends are removed from a plane while on the way to America to perform in Saddam The Musical is largely unnecessary and, while true, it could have been removed without upsetting the balance of the film. The film opens with a great opening sequence that sets up expectations – our protagonist is driving a stolen tractor through grape vines while trying to elude police and get to the airport to stop his girlfriend from leaving the country. Then we get an extended series of flashbacks, complete with requisite voice over, to tell us how this all came about. Aged 34 though, Sami is a bit too old to be convincing in his role, and maybe the film would have been better off casting someone else in the role, even though this is supposedly his story. Nonetheless he has a charismatic screen presence and a nicely self-effacing and dry style of humour. In her film debut Sawires has a nice presence and delivers a warm and intelligent performance as a more modern, strong and independent Muslim female. Hany delivers a warm and compassionate performance as the tolerant and wise Mahdi, a man devoted to his family and his community. Some bizarre casting sees an almost unrecognisable Ryan Corr (Holding The Man, etc) cast as Ali’s brother Wazza, a motor mechanic, who has fully assimilated into the Australian lifestyle. Ali’s Wedding has been shot on location around Coburg and there is some great location work that will resonate strongly with local audiences. The film has been nicely shot by veteran cinematographer Donald McAlpine (Moulin Rouge, The Dressmaker, etc). Nigel Westlake’s score deftly melds eastern and Middle Eastern influences. Ali’s Wedding tackles some serious themes with humour, and it serves up a serious plea for tolerance and understanding amidst all the anti-Muslim rhetoric currently being spouted everywhere. But importantly it is an engaging and entertaining romantic comedy that should have broad appeal.